The Junior Elementary children at Al Qamar Academy have been having a wonderful time learning about Air (Class 4) using lesson plans from the Homi Bhabha Centre for Science Education curriculum. Instead of boring black board based work, the kids did a number of activities to understand properties of air. 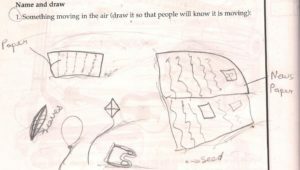 Some drawings, poem-writing and a sniffing field investigation of the nearby garbage dump and the grocery store also enlivened the things that they learnt. Particularly noteworthy is the width of ideas the questions asked by them invoke. First they captured air using plastic bags and saw how air is trapped when you fold the bag. They learned that air makes noise phut if the bag is burst suddenly and a wooo siren when let out gently from a balloon. They thought about how air does not pour out of an upturned glass but water does. They ran races holding an unfolded newspaper in front of them. It was hard. The paper kept pushing me back said Nusaibah, 8 years. The children filled 3 balloons with air, water and sand. They found it very difficult to put the sand in. First they blew into the balloon to make it big, then they tried to pour sand in. But by then the air would escape and the balloon would reduce to its original size. Eventually a respectable amount of sand was somehow pushed in. (They did not think of using a funnel). They had to think about which of these should be filled in car tyres. Initially the idea that a tyre full of water would burst and spill water all over the road bothered them as very messy. But after they had rolled these balloons on the floor, they saw that the air balloon travelled the furthest. Of course, squishing the balloons and twisting them to make shapes, checking out their weights were all done. In groups of 2-3 the children made parachutes using hankies, string, and stones. They weighted a toy camel and a piece of chalk respectively on the parachutes and saw how these floated down when released at different heights from a chair, from the top of a jungle gym and finally from the roof. The camel did not break because the air pushed at the bottom also pushed the hanky up! observed Abdurrahman, 7 years. They also tested to see which paper could be thrown the furthest a flat sheet or crumpled paper.They noted their observations and then drew bar charts to record their results. The kids filled up bottles with water and made holes at different places Aunty, cover the top of the bottle. 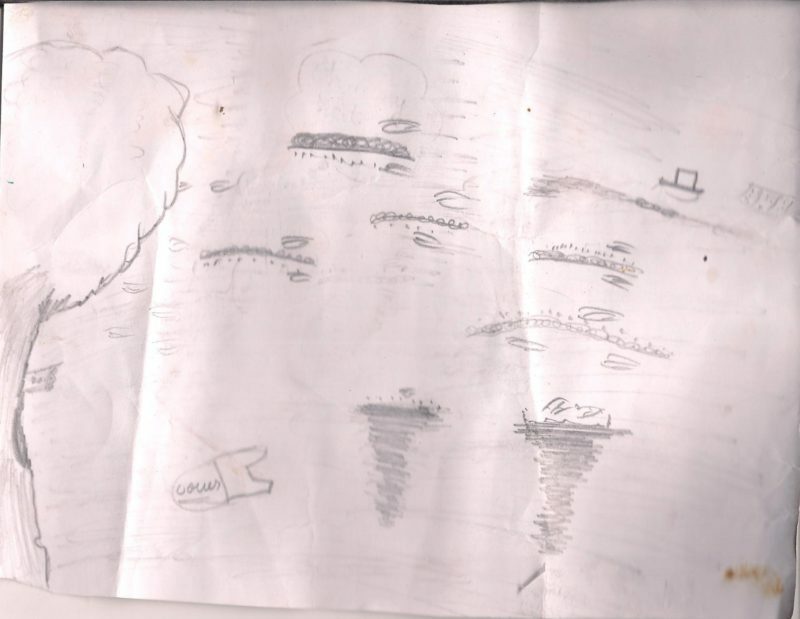 Then the water will not come out advised Mudassir, 9 years. So we tried,and for sure, Mudassir was right. It is because the air can not go in and push the water out he explained. 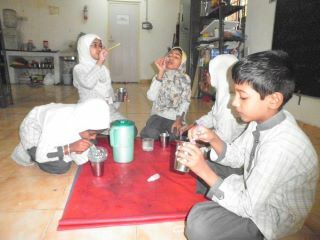 Finally today, the kids had a ball making bubbles using different solutions and straws. Bubbles are full of air said Samreen, 9. Plain water did not make any bubbles really. Water with Dettol soap make smaller bubbles with flew. But detergent powder made BIG bubbles. Then we added glycerine. The biggest bubbles which flew said Shahida, 7 years.They had seen bubbles in the sea water so they hypothesized that sea water must make lots of bubbles. We tried it out. But no, sugar or salt water did not make bubbles. They are thinking about why. No wonder the kids love science! There can be air everywhere. Even in soap and water, detergent and water and glycerine, detergent and water. And there is a proof for it. And they are bubbles. Our teacher told us to take a cup for each one of us. Then we, first using a straw in normal water, blowed bubbles. But we could not. Then we blowed inside the cup. The bubbles came inside it but did not come up. We tried with soap water and very small bubbles came and lasted for very short time. We tried with detergent water. The bubbles were big and small. And lasted longer. We did with detergent and glycerine mixed with water. It lasted the longest and made the biggest bubbles. This is because glycerine is sticky and the soap is slippery. The air makes it fly. In our class we made parachutes. Parachutes are what stops something from breaking, because they take it slowly down. We took Mudassir’s hankie. We put stones on each corner, tucked in the corners. We tied string around the corners. We took Naakat, my toy camel. Mudassir and I had a big argument on if we would put Naakat on the parachute or not. I will not and so Mudassir had to put Naakat on the parachute. The girls put a chalk piece. My teacher stood on a chair holding the parachute. She let go. It went down a bit fast. 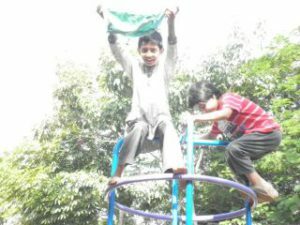 So then we tested it on the jungle gym. We climbed to the top. Mudassir let go of the parachute. It fell down a bit fast, just like it did before. It was my turn. I let it go. Again it went a bit fast. Then suddenly the news reached our ears that Sathik Uncle was going to drop down the parachutes from the top of the building. He started with ours. It went a bit fast but Naakat glided down. What we learned is that air pushes from the top of a parachute, sides and from under. Gravity takes the parachute down. So gravity wins against air. We did a balloon experiment. In that we had one balloon with mud, and one with water and one balloon with air. We wanted to know which goes (sic) faster. We took a wooden plank and we made it in a slanted position. First we kept the mud balloon. It went a little faster and we kept water balloon, it went fast and we kept air and it went the fastest (this was the child’s observation). We also tried it with keeping the plank straight. The same thing happened. I learned that the air goes faster because it is the lightest. There is air in every place. Even in a mud and in water an in an empty glass. One time our teacher told us to do an experiment on mud and water. We took 3 glasses. We filled mud in one glass. We filled water in the 2nd glass and nothing in 3rd glass. Our teacher told us to bring a 1000 ml measurement cup filled with water. Our teacher poured the water in the mud and the bubbles were coming out because the air inside the mud was pushing the water and trying to escape. The air escaped. The water stayed up because the air went out and we tried another experiment. Our teacher told us to bring a bottle and make holes and we filled with water and the water was going out because the air was pushing it again. We closed it with the bottle cap, the water stopped coming out because the air can’t come out and the air is blocked. I understood that the air has muscles. It can push the things out. Air can be in everything and everywhere. 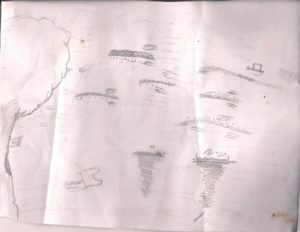 Following are some of the drawings by the children, on things blowing in air. Nusaibah Anas writes a beautiful poem on Air. The teacher talks about the experience. The kids loved the activity where they had to hold their breath and count (tick-tick one!..). They competed. Of course one or two silently took breaths (involuntary). They also loved the exercise where they blew up a series of balloons and recorded the result (didn’t go beyond 2 balloons). We did the activity for CO2 with a pepsi bottle and a balloon. They knew about oxygen going in and CO2 being breathed out. “But do plants also need oxygen? Yesterday we tried to understand smells – nice smells and bad smells. We took a walk to the nearest garbage dump and took deep breaths. Then we crossed the road to the grocery shop and sniffed a rotten tomato. We waited at the roadside and inhaled as motorcycles, trucks and cars went by. We went back to school and smelled heeng, camphor, powder, agarbatti. How do the smells get to our nose? “Air carries them” said Samreen. Why does a rotten tomato smell different from a fresh one? “Its giving out gas.” Rotting things give out gases. We discussed the smell of a leaking gas cylinder, petrol, dust, powder. Smells from the kitchen, smells from the bathrooms, smells in the bedrooms. We discussed gases. How did oxygen come about? What was the air like in the early days of the earth? What are fossil fuels? What is smoke? Then came the questions – tumbling out. “How did they find fossil fuels and how did they know it was a fossil? How did they know it could be used to burn things?” “If we need oxygen, then why do we drown when water is made up of oxygen?” “Does the air in an empty box have weight?” “Where does LPG come from?” “How do they make matchsticks and why do they burn?” “Where does the bathroom waste go?” “Why is the sea salty?” “How does petrol make a car go?” -all from ONE class today. 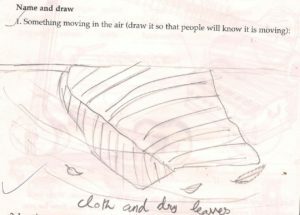 Also one of the kids got inspired by the last few activities on Air – where we discussed bacteria. She went off and did some research and wrote this. Bacteria belongs to one of the Kingdoms and it is called Monerans. They float in the air, and live on icy mountain tops, in the scalding water of hot springs, in dark caves and on the bottom of the sea. Another kid wanted to know how they found a virus. We get loads of questions on “how did they find….”, especially about very small things – bacteria, virus, atoms, electrons etc.